Corticosteroids and NSAIDs appear to have similar efficacy in the management of pain in adults with gout but corticosteroids found to have a more favorable safety profile for selected adverse events, according to the results of a meta-analysis of randomized control trials published in the Journal of Rheumatology. Gout is the most common type of inflammatory arthritis that may cause disability in the short term. 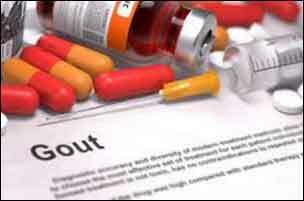 Current clinical guidelines recommend NSAID’s as first line of treatment for acute gout pain. Recent trials suggest a possible first-line role for corticosteroids. Randomized and quasi-randomized trials comparing benefits and harms of corticosteroids and nonsteroidal anti-inflammatory drugs for treating acute gout in patients older than 18 years were included. The primary efficacy outcome was pain scores at less than 7 days and greater than or equal to 7 days; the primary safety outcome was bleeding. Secondary outcomes included joint swelling, erythema, tenderness, activity limitation, response to therapy, quality of life, time to resolution, supplementary analgesics, and adverse events. Six eligible trials which involved 817 patients were identified. The mean study follow-up was 15 days (range 4-30). Risks of bias were generally low. In low- to moderate-quality evidence, corticosteroids did not have different effects on pain score at < 7 days or at ≥ 7 days when compared with NSAID. There was no evidence of different risks of gastrointestinal bleeding [relative risk. There was no evidence of different responses to therapy on pain at < 7 days and ≥ 7 days, time to disease resolution, or a number of supplementary analgesics used. There was a lower risk of indigestion, nausea, and vomiting with corticosteroid therapy. The study concluded that there is no evidence that corticosteroids and NSAID have different efficacy in managing pain in acute gout and appear to be more cost-effective than NSAIDs.